I think there’s a possibility it got a bit squinched. If (and this is a BIG if) these laminae were cartilage in the juvenile animal, and only started to become bone as it grew, the wrinkled appearance could be because something heavy put a lot of pressure on the top end (the broken end) of the lamina and slightly squashed it. What is it? I don’t know… maybe a rock fell on the creature… maybe this was a female Xenoposeidon that was a bit too young and small for the male that tried to pass on his genes. Whatever it is, the biggest piece of the puzzle is missing: the piece of the neural spine that WAS above the lamina. If more and better verts from this thing are found, there might be a clue. Or it could just be that predators left those marks with their serrated teeth. The lamina’s edge does look a bit concave, like some bone was scraped off of it. Though whether this was a fatal injury, or occurred after its death from scavengers, is hard to know…. This fossil is old, right? Why are we surprised to see wrinkles on something old? You’re lucky it’s not telling you to get off its lawn. How about a low-tech stereoscopic image pair, i.e. two shots with the camera moved a little between shots? Why isn’t this a standard part of paleo presentations? By the way, your expression “maybe … we poor palaeontologists are ignorant” is one of the things that makes paleontologists so adorable. You’d never catch an astronomer saying that (about, you know, astronomers). I think you mean to say Neosauropoda incertae sedis. “Indeteriminate neosauropod” indicates that the taxon is not diagnosable beyond Neosauropoda and that Xenoposeidon is a nomen dubium! Has there been any opportunity to do a CT scan of this vertebrae? Please excuse me, but I somehow missed the beginnings of this story. News filters slowly to the antipodes, and Butte, MT is about as far from the beaten path as you can get. Yikes, really, Randy? That’s scary. So is there an adjective that means what I want to say here? Reworking the whole sentence to say “Xenoposeidon is Neosauropoda incertae sedis” seems unnecessarily heavy-handed. Nima, I am 99.9% confident that what we’re seeing here is not the result of scavenging/predation: the features are definitely wrinkles, not scratches. 3. the killer: very young sauropods — young enough for their vertebrae to be cartilaginous — didn’t have laminae at all. All the beautiful complex features of sauropod vertebrae developed only as the animal matured. Reworking the whole sentence to say “Xenoposeidon is Neosauropoda incertae sedis” seems unnecessarily heavy-handed. I dunno about paleontological usage, but “Xeno is a neosauropod incertae sedis” would make a lot of sense from a Latin grammar standpoint (incertae sedis being literally “of uncertain seat”). For what its worth, I’ve seen similar wrinkles on the rims of the ‘proto-pleurocoels’ of really basal forms like Antetonitrus, Melanorosaurus and relatives. To me they look like the bone was puckered around the depression (which may or may not have been pneumatic). Perhaps diverticula sometimes get bunched up and ‘puckered’ and the resulting wrinkles are then moulded in bone – I’m just guessing though, I don’t know if modern avian pneumatic features ever develop these wrinkles. Interesting stuff, Adam. Do you know if this texture is figured anywhere? It obviously didn’t make it into the Antetonitrus six-pages; and I have your papers on the skull and forelimb of Melanorosaurus, but nothing on the vertebrae — did I miss one? Hopefully, Darren will get all the neontologists over on Tet Zoo to come and have a look at this. No these features have never been figured, or probably even noticed by anyone but me. The best ones are actually on an undescribed taxon I’m working up at the moment. I only noticed them recently when I really started looking hard for pneumatic features. I’ll bounce along some pictures when I eventually get the time to take the photos. A bit of explanation for our readers: Mike has been talking about “wrinkled texture” on one of the Xeno laminae for ages. I thought he was talking about something else, a sort of wavy or crenulated texture of the bone between two laminae, which is pretty common in sauropods. I hadn’t seen the image of interest before, so we were talking past each other. I have never seen anything quite like this. I don’t know what caused them, but I know what didn’t cause them. My first thought was that it looked like gnaw marks, not from a theropod but maybe from a multituberculate, but I agree with Mike that the marks are not something inflicted on the bone by another animal. They are features of the bone itself. They’re not anything having to do with cartilage; stressed cartilage would simply ossify into a different shape, and any wrinkles in cartilage or bone imposed by stressing the system ought to be ironed out pretty quickly by bone remodeling. My default assumption is that they must have something to do with pneumaticity, because according to everything we think we know, laminae border pneumatic diverticula, and also because pneumaticity can produce lots of weird textures on bones. I’ve just never seen this specific thing. It’s possible that I have a blind spot here, that I’m such an air-head that I actually can’t think of reasonable alternative hypotheses. So please, keep the ideas coming! Unfortunately, I really don’t know of a non-clunky way to say it. I think Andreas’ suggestion is best. Since Darren snubbed you on TetZoo, mentioning Matt’s posting but not yours, we may never get to the bottom of this. I wouldn’t get too mad at Darren, though, under the circumstances. Hey Mike, if the people that claim these wrinkles are common are right, it could just be a natural feature on certain species… Perhaps where some sort of strong tendons were attached. If some predator managed to bite into the spine and pop an air sac, and the wound got infected, this may be the result. Other than that I don’t have a whole lot more guesses. 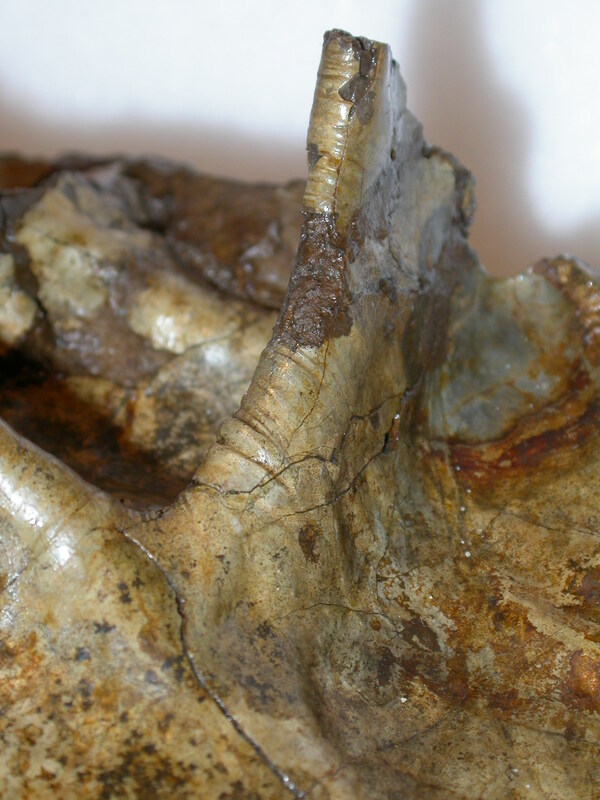 If the vertebra was complete, with neural spine and everything, there might be more clues. I don’t know who originally dug up the bone, but their notes (if they kept good ones) may offer a clue. So would more remains… has any more Xeno material been found since 2007? What’s also interesting is the brown area in halfway down the lamina… is the bone surface broken there or just discolored? Don’t get me wrong, why, I’d love to feature this on Tet Zoo… it just tampers with my busy schedule. I’ll mention it in the next Tet Zoo posting. And, for the record, I can’t recall seeing the same texture anywhere else. 2-it looks like grooves where some longitudinally-ridged band or ribbon of tissue has run to and fro long-term (like one pulls a towel to-and-fro to dry one’s back). 3-it reminds me of surface of flowstone (stalagmites, stalactites) or icicle forms. I think I can add a view unique at SVPOW!, but sadly unhelpful, when I say that I’ve never seen anything like that feature in international trade law dealing with government procurement. Only slightly more usefully, I would suggest that English should do to say that ‘Xenoposeidon is a neosauropod of uncertain affininties’. 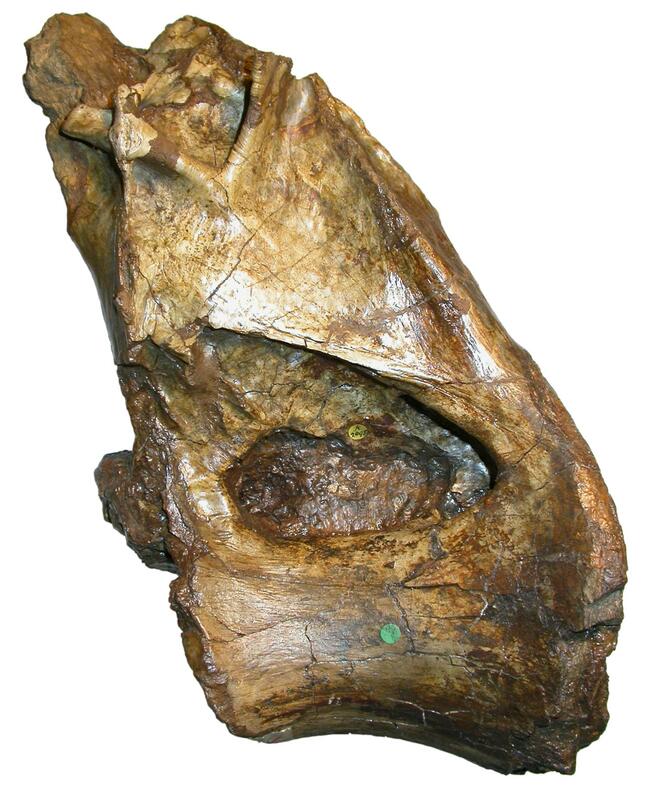 There’s something very similar on the Metriorhynchus (Thalattosuchia)skull I’ve been looking at this week, especially in places inside the orbit and temporal fenestrae. Other specimens don’t show it as well or at all, so not much help there. That type of wrinkling is relatively common on the braincases of dinosaurs…particularly near the junction of the laterosphenoid and orbit. “relatively common” meaning i can think of 2 or 3 specimens off the top of my head….IDK why it forms but my guess is an interface with periosteom, but whether the underlying surface is originally membranous/cartilaginous or what have you…i don’t know. It doesn’t seem to be muscular in nature either. There are femoral midshafts that also have large mediolaterally oriented concentric wrinkles on them as well…the left femur of Sue the Trex comes immediately to mind. For example, humans can have short thumbs or be double jointed, but this sort of skeletal deviation from the norm is not due to infection or attack. With sauropods, there was a far larger body area for things to occasionally go wrong (or simply strange). I don’t know about bone, but I’ve seen exactly the same texture many times on wood – specifically, a number of smooth-barked eucalypts, around the point where branches form. I’d guess that it’s something to do with the bark around the growing branch crinkling a little (as the creases are parallel to the surface of the new branch) and the wood underneath growing to fill in the crinkles. If my guess is right I think it would support the notion that this is some kind of crinkling of the surrounding soft tissue while the bone was growing. What would Xenoposeidon’s ecology have been like? What predators were contemporary that could have eaten something that size, and what plants would it have eaten (if that’s known)? I’m considering a piece for the ARTevolved ‘prehistoric environments’ thing, and my idea was Neovenator and Xenoposeidon; while they’re both from the same general time and place, did they actually meet, and would Neovenator have been able to eat a Xenoposeidon? It seems feasible – the size difference would be less than between wolves and moose, and even lone wolves sometimes kill moose – but would it have happened? And was Eotyrannus actually contemporary with both? William, I don’t know much about that kind of thing. Your best bet is to email your query directly to Darren, who has a much broader grasp of Wealden stuff than I do. Could a Neovenator kill a Xenoposeidon? Probably; but I bet the moose kills a wolf every now and then, too! Long time since the last comment on this, but I think I might have hit something. The marks are certainly not from any sort of dorsoventral compression, as the entire rest of the vertebra is still proportionate to similar basal neosauropods. An infection is unlikely, as why would a perfectly preserved (in the general sense) dorsal have the same infection on both sides. Like stated by a few above, the wrinkles are not the cause of pathology or predation, because the teeth of predators would leave the bone scarred and scratched. The most plausible reason I can think of right now is that some sort of tissue was positioned along the laminae that was held in place by the grooves. I’m not stating that the bone is rugose (as clearly it is not), but I think it is possible that some type of ligament or tendon running across the back was supported by these wrinkle-shaped grooves. The dorsal ribs might have also featured such grooves, and between the two bones (and of course the connective cartilage) they might have been enough to hold up one or more ligaments. PS. I hate to say it, but a 2012 study found this very dinosaur dubious, with no autapomorphies (D’Emic, 2012). The thing about your suggestion is: why don’t we see anything similar in the bones of other animals? Hmmm. After considering the function of the wrinkles, I actually now think that they have to do with the size of the animals. No ornithschians have been preserved with the wrinkles, and no ornithschians were as huge as sauropods. I know some theropods have something similar, but just let me think. By sunday I should have something brainstormed. But remember, Xeno was not a big sauropod. Not much bigger than an elephant, probably. Yep, I have realized the only possibility that is supported by all the features yet uncovered. The Xenoposeidon vertebra could not have been compressed from above (or any side), like I stated four comments above. No pathology would have caused such smooth grooves that wrap around the postzygapophyseal laminae. It being an attachment or a groove for ligaments, or cartliage would not explain why the feature is lacking in extant animals. Only plausible possibility is that the grooves supported some internal pneumaticity, which would explain their lack of uniformness. The only thing that could prove or disprove this possibility would be a CT scan, none of which have yet been done on this taxon, and one of which I recommend is done (A paper on dinosaur wrinkles would be extremely interesting, he he). Only plausible possibility is that the grooves supported some internal pneumaticity, which would explain their lack of uniformness. I agree that they are probably pneumatic. I disagree that the “only” possibility is internal pneumaticity. Lots of pneumatic bones have a scalloped texture, probably from lots of little diverticula pressing up against the bone. If you took a whole bunch of mm-scale diverticula (like the “bubble-wrap” diverticula shown in the rhea neck in this post) and wrapped them around a lamina, the scalloping would probably manifest just like the wrinkles in Xeno. You use the word ‘only’ a lot. CT is far from the only thing that can reveal internal pneumaticity. There are other kinds of radiographic scans (like neutron tomography), plus fortuitous breaks in the specimen, or deliberate cuts. But I suspect that none of those would be useful here, because these laminae are probably solid. In practically all eusauropods other than titanosaurs, the laminae are thin plates of solid bone. When the laminae are inflated from within, as in most titanosaurs, they tend to be really broad–in fact, a lot of titanosaur vertebrae look like someone hooked up an air hose to regular sauropod vertebrae and inflated them. The Xeno laminae are pretty thin, so probably solid. But the wrinkles could still be pneumatic in origin, as explained above. what if those wrinkles are a work of healing? and the way it looked, maybe bite marks? just thought i let you know of my thoughts. So, let me know what you think of them. thanks. It’s an idea, Neil, but I keep coming back to the question of why we don’t see the same wrinkled texture on other specimens. And there are plenty of other dinosaur fossils that show healed bite marks. Maybe it’s a case on how bad the damage is on the bone? Did you try and get it x-rayed and see what they really are?